The night of Tuesday 9 April has all the ingredients to be a Masters dinner like never before in its 67-year history. It could be like watching a particularly cringeworthy episode of that TV reality series Come Dine With Me, where the host is on a hiding to nothing from his guests. 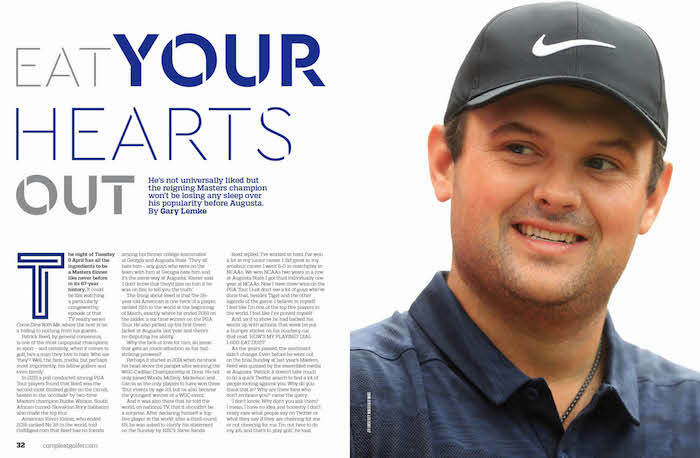 Patrick Reed, by general consensus,is one of the most unpopular champions in sport – and certainly, when it comes to golf, he’s a man they love to hate. Who are ‘they’? Well, the fans, media, but perhaps most importantly, his fellow golfers and even family. In 2015 a poll conducted among PGA Tour players found that Reed was the second-most disliked golfer on the circuit, beaten to the ‘accolade’ by two-time Masters champion Bubba Watson. South African-turned-Slovakian Rory Sabbatini also made the top four. American Kevin Kisner, who ended 2018 ranked No 38 in the world, told Golfdigest.com that Reed has no friends among his former college teammates at Georgia and Augusta State. ‘They all hate him – any guys who were on the team with him at Georgia hate him and it’s the same way at Augusta,’ Kisner said. ‘I don’t know that they’d piss on him if he was on fire, to tell you the truth.’ The thing about Reed is that the 28-year-old American is one heck of a player, ranked 15th in the world at the beginning of March, exactly where he ended 2018 on the ladder, a six-time winner on the PGA Tour. He also picked up his first Green Jacket at Augusta last year and there’s no disputing his ability. Why the lack of love for him, an issue that gets as much attention as his ball-striking prowess? Perhaps it started in 2014 when he stuck his head above the parapet after winning the WGC-Cadillac Championship at Doral. He not only joined Woods, McIlroy, Mickelson and Garcia as the only players to have won three Tour events by age 23, but he also became the youngest winner of a WGC event. And it was also there that he told the world, on national TV, that it shouldn’t be a surprise. After declaring himself a ‘top five player in the world’ after a third-round 69, he was asked to clarify his statement on the Sunday by NBC’s Steve Sands. As the years passed, the sentiment didn’t change. Even before he went out on the final Sunday at last year’s Masters, Reed was quizzed by the assembled media at Augusta. ‘Patrick, it doesn’t take much to do a quick Twitter search to find a lot of people rooting against you. Why do you think that is? Why are there fans who don’t embrace you?’ came the query. ‘I don’t know. Why don’t you ask them? I mean, I have no idea and honestly I don’t really care what people say on Twitter or what they say if they are cheering for me or not cheering for me. I’m out here to do my job, and that’s to play golf,’ he said. Reed is not even unanimously popular in his own family. He has been estranged from his parents for several years, and was described by his sister Hannah as a ‘selfish, horrible stranger’ in a Facebook post in 2016. Shane Ryan, the author of the bestseller Slaying The Tiger: A Year Inside the Ropes on the New PGA Tour, is described by USA Today as reckoning, ‘There was a code of silence regarding Reed’s time at the University of Georgia (UGA), a type of golf omerta.’ Ryan brought up whispers that Reed had cheated on the course during a qualifying round (trying to hit a better-positioned ball that wasn’t his), reported better scores than he’d shot and may have stolen from teammates ($400 and a Scotty Cameron putter, Ryan’s source said). Reed denied these claims and said that he was ousted for multiple alcohol arrests. According to reports, those incidents were nothing more than the usual college-kid stupidity. But a Georgia assistant coach argued that Ryan’s report was accurate and that UGA chose not to associate with ‘Patrick as a person’. Last year Reed, who had earned the nickname ‘Captain America’, based on a Ryder Cup career record of six wins, one loss and two halves heading into the encounter with Europe at Le Golf National outside Paris, fell out with his teammates after being paired with Tiger Woods and not Jordan Spieth, with whom he’d struck up a successful partnership at previous Cups. Reed and Spieth had won four and halved two of their seven matches together at Gleneagles and Hazeltine, but Reed was twice paired with Woods, and Spieth played four matches with Justin Thomas in Paris. Reed and Woods lost both their matches against Francesco Molinari and Tommy Fleetwood, and despite beating Tyrrell Hatton in the Sunday singles, the US went down 17½ to 10½. The American let loose. ‘The issue’s obviously with Jordan not wanting to play with me,’ Reed said. ‘I don’t have any issue with Jordan. When it comes right down to it, I don’t care if I like the person I’m paired with or if the person likes me, as long as it works and it sets the team up for success.’ And after the defeats alongside Woods, Reed was ‘benched’ for two matches on the Saturday at Le Golf National. LOL, as the screen generation might say, but we will see if it’s more a case of laugh out loud than lots of love if Reed has to do the reigning champion’s duties and put the 2019 Masters Green Jacket around the shoulders of Spieth when it comes to the end of this year’s Masters, as is the traditional duty of the reigning champion. Spieth has already won The Masters, in 2015, so he knows his way around the tricky, hilly course with the challenging greens. It would be the ultimate irony if Reed has to so publicly honour his Ryder Cup teammate. The real hope will be that at The Masters dinner on 9 April, two days before the first men’s Major of the year starts in earnest, the host, reigning champion Reed, manages to get a perfect ‘10’ in golf’s version of Come Dine With Me. And what does the American have in store for his guests, an exclusive list with invites given to only those who have won The Masters before, plus a few other hand-picked individuals? For the sake of The Masters champion let’s hope the way to his fellow golfers’ hearts really is though their stomachs.